View the entire table of contents for the June 30, 2003 issue. Henry Spoto earned bragging rights at the 20th annual Home Winemakers Classic in Rutherford, Calif., last July. The 71-year-old retired real estate appraiser won first-place ribbons for both of his entries, Cabernet blends from 1999 and 2000. 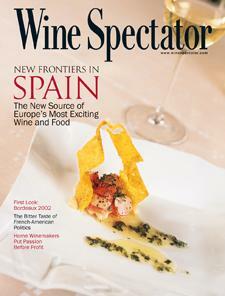 For the full article, check out the new issue of Wine Spectator, on newsstands June 30, 2003.